DAVAO CITY, January 27, 2017 (PIA) The National Economic and Development Authority in Davao Region has identified seven priority projects that are sure to happen in Davao City from 2017 to 2022. SAMAL, DAVAO DEL NORTE: The Knights of Online Marketers (KOM), together with the Department of Information and Communications Technology - DICT Mindanao Cluster III, under the leadership of Director Alimbzar Azum, and the Local Government Unit of the Island Garden City of Samal, under the leadership of Mayor Al David Uy, successfully concluded a Virtual Assistant Orientation Program as a preparatory development program for Rural Impact Sourcing initiatives to bring digital opportunities through online jobs and digital entrepreneurship. Miss Piper Ramboanga the resource speaker thanked all the participants especially the committee who organized the event. "It is indeed SUCCESSFUL! Thank you, Mayor Al David Uy and Davao del Norte PFT Lead Engr. Eduard Tuquib for this opportunity. Truly, an ICT development!" she also said. DAVAO City, January 3, 2017 (PIA) Experts from the Bureau of Fisheries and Natural Resources in Davao Region found several plastic materials, fish net, coconut lumber with nails among others in the belly of the sperm whale that beached at the Island Garden City of Samal, Davao del Norte two weeks ago. POWER BOOST. Davao Light and Power Company executive vice president and chief operating officer (EVP and COO) Arturo Milan (leftmost), incoming EVP and COO Engr. Rodger Velasco (second from right) and Substation and Electrical Equipment Department (SEED) manager Engr. 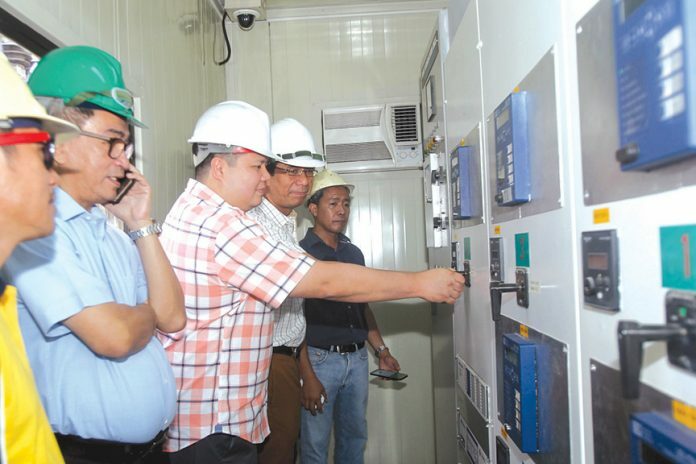 Ledio Peñafiel (rightmost) assist Mayor Al David Uy of Island Garden City of Samal (IGaCoS) as he turns on the switch to energize and reconnect the Samal submarine cable at DLPC Pampanga substation in Bo. Pampanga, Davao City yesterday. Uy requested DLPC to provide stable electricity to Samal as the generator sets currently supplying electricity is not sufficient to energize the entire island. LEAN DAVAL JR.
Talikud: This Beach May Have the Bluest Water in the Philippines!